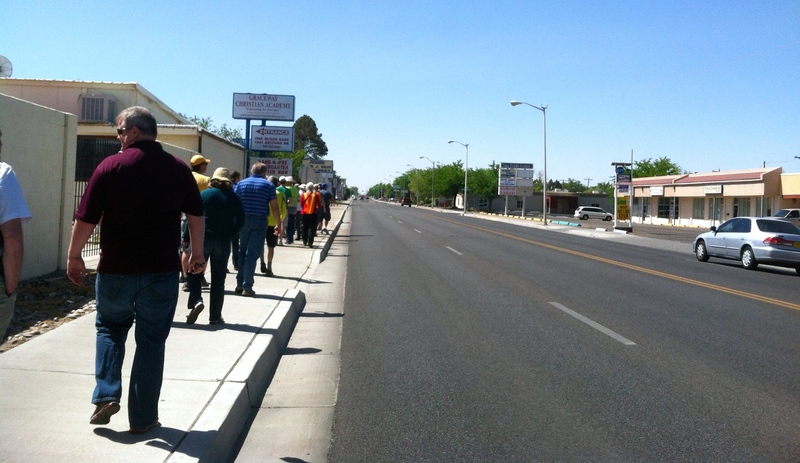 Dan Burden leading one of his famous “walking audits” on Constitution Road, ABQ, NM. The recession has not been kind to Albuquerque. Since 2008, a massive shift in consumer preferences and economic activity has left the traditional economy in shambles. As other cities and states “recover,” Albuquerque continues to hemorrhage jobs and young, educated millennials. Some would see the above statement as negative and currently, in the short term, it is. However, it’s also an incredible opportunity. The longer we go without a “recovery,” the more we are forced to collaborate on local sustainable solutions. The city, UNM and CNM are finally beginning to understand this. An example is the Innovation Central project, a collaboration between several agencies in the region. This can been seen on the micro level as well with children moving back in with their parents. Again, this is a potential positive: multigenerational families can share labor, ideas and collaborate more effectively. Grandma can watch the kids while mom works. On the flip side, mom can show grandma how to use the computer. Most cultures operate this way and it’s a healthy way to exist. 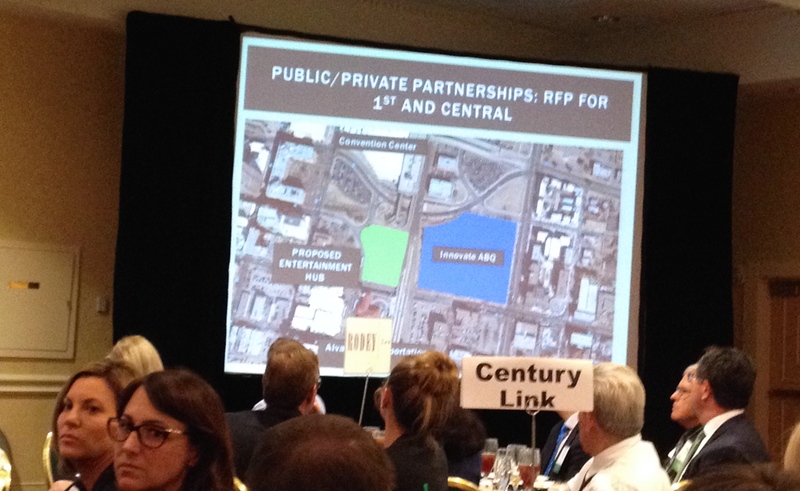 An image from a NAIOP presentation about the mayors proposal for the Innovation Center in Downtown ABQ. I could go on, but I want to jump to a larger problem: infrastructure, specifically transportation infrastructure. We have built a civilization that is impossible to navigate without an automobile. This is inherently discriminatory: over 1/3 of our society cannot / does not own an automobile. As our society ages, this problem will only accelerate. Young, elderly, poor… a huge percentage of our society, stranded in the suburbs. This brings me to the lessons of Dan Burden, people street specialist. 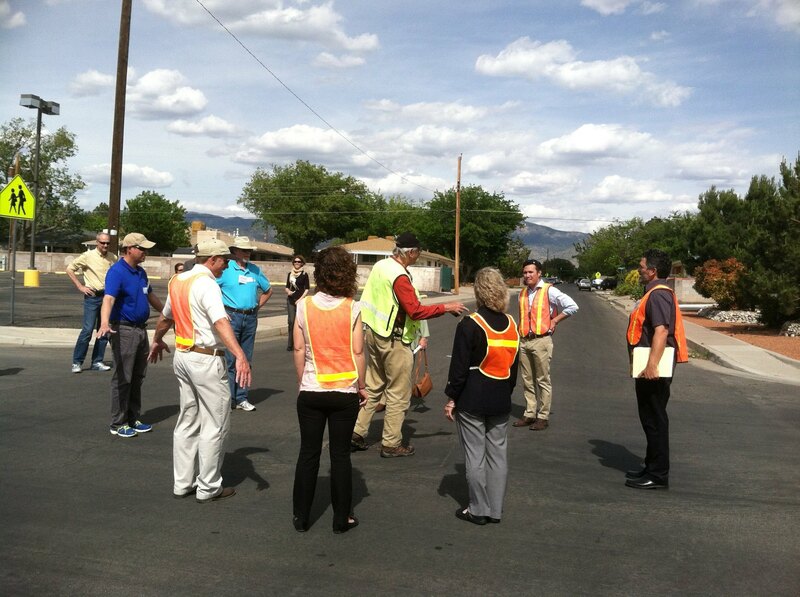 Thanks to the generous contributions from AARP, UNM, the Mid-Region Council of Governments and other partners, the Complete Streets in New Mexico Leadership Team hosted Dan Burden in Albuquerque on May 16-17. His analysis focused on San Pedro Road and Constitution Avenue in the Fair Heights and Mark Twain neighborhoods. Dan is famous for several reasons. The field of planning, or any field for the matter, is dominated by meetings behind closed doors in badly designed windowless buildings. This environment leads to equally closed minds. Dan throws all of that out the window, gathers everyone together and takes them on a walk. On these walks, Dan uses the crowd to teach lessons. For example, during our walking audit in the Mark Twain neighborhood, Dan used the audience to create a human traffic circle. A car approached and drove around us, carefully and safely. Lesson learned. No long, complex jargon filled explanation was required. A Dan Burden walking audit is a form of street theater. 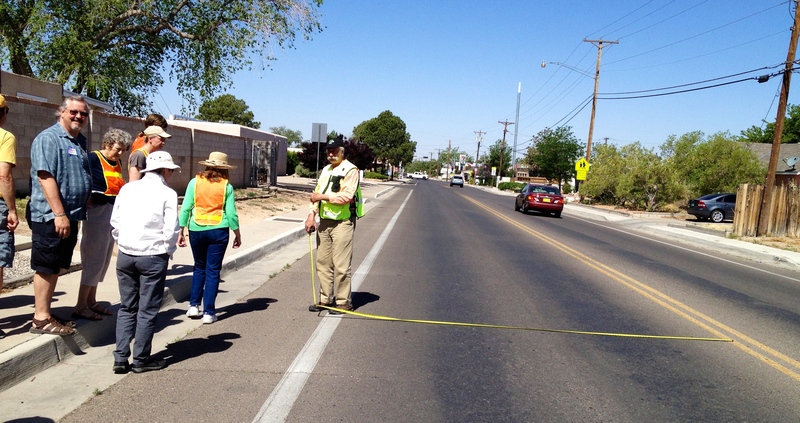 He is famous for throwing a tape measure into the street, disregarding oncoming traffic. Dan does this to make a point, to teach a lesson and to draw attention. He takes measurements in real time and explains why the design leads to bad behavior and points at actual observed examples. What does this have to do with our local economy? This is a point I have discussed in previous posts, especially in my article about Indian School: high speed traffic not only kills people, but it also destroys our local economy. Regarding San Pedro, it is an economically depressed corridor in large part due to the ineffective and inefficient transportation infrastructure. Mr. Burden proposed a solution. 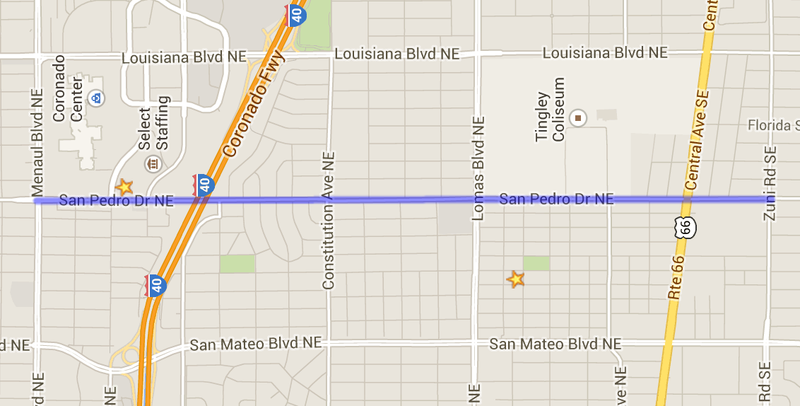 The blue line on this map highlights the segment of San Pedro which requires change. This is also a Dan Burden innovation. It’s powerful because it only requires paint. For the modest investment of $40,000 (~$15,000/mile, 2.5 miles, source: scroll to bottom of page), San Pedro can be redesigned with people in mind. A road diet on San Pedro would take the current 4 high speed traffic lanes and convert them to 3 lanes + bikes lanes on each side. One of the three lanes would be a center turn lane with opportunity to build medians and concrete crosswalk islands. In addition, a road diet allows for safer and more efficient movement of automobiles. 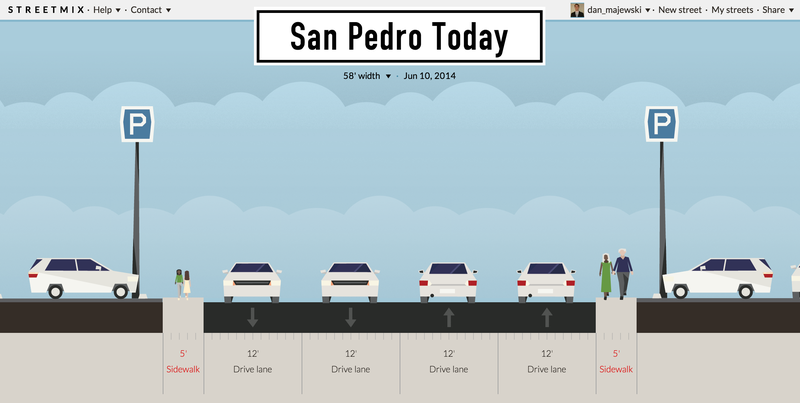 This is a diagram of San Pedro today. No bike lanes, narrow sidewalks and no easy way to make a left turn. Here’s an example: Today, if a vehicle wants to make a left turn from San Pedro onto another street, they have to stop in the middle of traffic. People behind them have to stop. Sometimes, they aggressively switch to the right lane instead. This leads to dangerous, high speed crashes. Because of this bad design, it is difficult and dangerous to access businesses on San Pedro. The most important thing to understand about a road diet: the stakeholders who stand to benefit the most are the business owners! Some of the businesses owners on San Pedro are resistant towards road diets because they perceive them to be a “reduction in capacity”. A road diet actually leads to an “increase in efficiency”. Providing a center turn lane makes it far easier to both access businesses and move vehicles through the corridor. Another benefit is a large reduction in speed. Why is this so beneficial? For Bicycles and people on foot: slower speeds = safer crossings and corridors. A collision at a speed below 20 MPH is almost never fatal. At 40 MPH, it’s almost always fatal. A slower corridor is a safer corridor and a safer corridor leads to an increase in people walking and biking. For businesses: Dan Burden says that the ideal speed for a businesses district is 19 MPH. At this speed, motorists have enough time to see a businesses, slow down and park. This leads to local commerce and a more vibrant corridor. This image shows how with the same amount of space, you can effectively move traffic and improve access for everyone. Added benefit: the bike lane buffers the sidewalk from vehicle traffic. 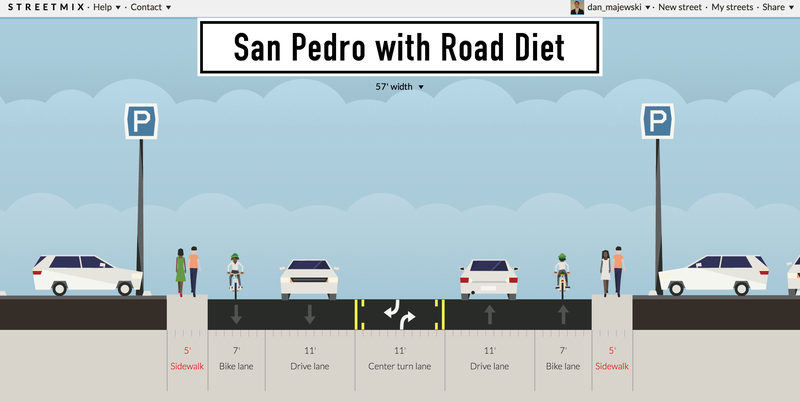 How can we, as a community, make the San Pedro Road Diet happen? There are a few barriers to this project. However, there is huge support for it as well. SUPPORT: The Mark Twain and the Fair Heights neighborhoods are organized together in support of this project. The Dan Burden event took place at Mark Twain Elementary School. The principal of the school attended much of the workshop and he was very supportive of everything discussed. The recently elected City Councilor for the area, Diane Gibson, attended as well. She also stayed after the presentation to speak one-on-one to some of the louder voices of resistance in the room. RESISTANCE: There a two primary voices of resistance against this project. One of the voices is a collection of businesses owners along the corridor. They feel that reducing vehicle lanes = reduction in traffic = reduction in businesses. As we’ve read above, this simply isn’t true. Luckily, this is a problem that can be solved through education. It will not be easy but it’s certainly doable. For what percentage of the day would San Pedro be in “failure”? 2 hours? 30 minutes? 5 minutes? For most of the day, San Pedro is empty. Based on what was said, the engineers intend to design a road that functions well for a small percentage of the day and badly for the majority of the day. On top of this, vehicle miles driven (VMT) locally have been dropping steadily since the early 2000s and transit ridership locally has doubled in the past decade. This trend will continue as our population ages and mass transit improvements are made. San Pedro also has redundancy. There are several parallel roads with space to absorb a few extra cars per day. This voice of resistance will be more difficult to defeat. We as a community must work together to patiently educate and explain to these engineers that the decision to prioritize motor vehicles is destroying our community. Adding safe bicycling facilities and reducing traffic speeds should be the top priorities for traffic engineers working on our local streets. Luckily, according to Dan Burden, once a single road diet happens, the barriers crumble and they become common place across the community. THE VISION: Below, is an idealized image of the Mile Hi District. This is the historic name of the business cluster on San Pedro between Lomas and Constitution. The name is the result of the elevation of this area being exactly a mile above sea level. Restoring this historic brand will be an important part of reinventing this potential filled corridor. 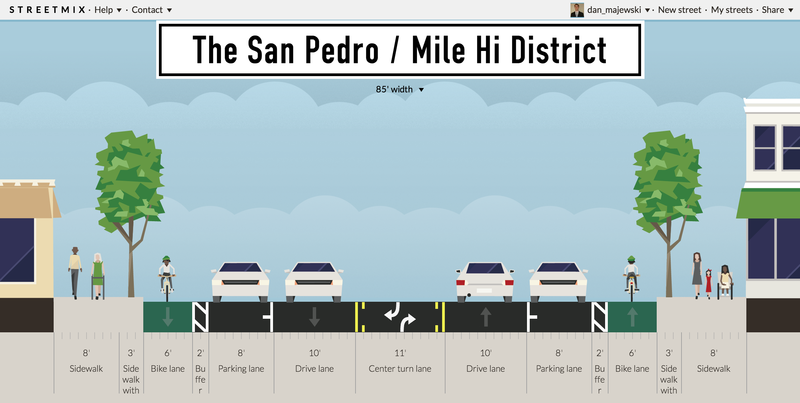 Linked here are more redesign proposals for San Pedro. The image below has it all: buffered bike lanes, nice buildings, wide sidewalks, on-street parking, etc. The final product might not have all of these elements but we need to work as a community to include as many of these elements as we can. THE CHANGE: It’s time to change how we think about transportation in our community. We all gripe about how Albuquerque is a “car town” and this is the opportunity to turn things around. If data is collected properly, this project could set the stage for a major transition in our community. In a place with such temperate weather and 300+ days of sunshine, it is unacceptable that we are unable to walk or bike safely to most destinations. What do you want to see on San Pedro? This may look impossible or unrealistic but plenty of communities have accomplished projects like this. Contact Councilor Gibson and tell her you support this action. The squeaky wheel gets the grease. If the support is more vocal than the resistant business owners, this project WILL happen. When an issue receives just 10+ emails or phone calls, it becomes a high priority one. Send out links to this post to anyone who you feel could influence policy on this issue. Thanks for reading and keep on pushing for positive change in your community.